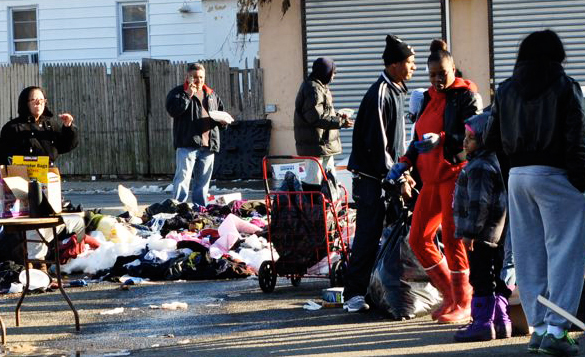 Rockaway residents ignore mounds of soggy donated clothing in the middle of the street and wait for services to be restored to their homes. Hella Winston is a senior fellow at the Schuster Institute for Investigative Journalism. She has written extensively about child sexual abuse coverups in some fervently Orthodox communities for The New York Jewish Week. The series won awards from the American Jewish Press Association and the Journalism Center on Children and Families. After Hurricane Sandy, Schuster Institute Senior Fellow Hella Winston headed from her Manhattan-based office to the Queens neighborhood of Far Rockaway, New York, a storm-ravaged coastal community. Given the circumstances she found there, she stayed to report. Here is what she wrote about what she initially saw there and the situation her reporting will track. “One of the first things that struck me and my friends when we first made it out to Far Rockaway last week was the almost total absence not only of the power company and the major disaster relief organizations, but of the government, most notably the police—many more of whom seemed to have been deployed to guard the long gas lines than to patrol poor storm-ravaged neighborhoods. "Instead, residents have been relying on community-based initiatives, which lack formal disaster-relief training and the equipment or social infrastructure to provide the necessary assistance. While these groups are doing critical work providing food, water and, in some cases, medications to residents, they don’t have the ability to restore power or heat, provide mass transportation alternatives or ensure the safety of residents. On Friday, November 9, 2012, Schuster Institute Senior Fellow Hella Winston made her fourth visit since Hurricane Sandy to the Rockaway Peninsula in Queens, one of New York City’s hardest-hit neighborhoods. Two weeks after the storm, electric power is not restored and residents have abundant needs. Winston writes about what she observed and learned from the people there with whom she spoke. On Friday I went to the eastern section of theRockaway Peninsula with three researchers affiliated with the City University of New York (CUNY). Their goal is to record where goods and services are needed and where they are being deployed. Later the CUNY researchers will update these locations on their online map in an effort to accurately align the needs of the community with the efforts of individuals, organizations, and government agencies that are assisting with the recovery and reconstruction effort here. On my prior visit, it was clear that much of what was being donated—or, in certain cases, it was more like what was being dumped into the community—is not going to be useful or even desirable to residents, like the piles of old shoes we saw in the Occupy Sandy distribution center, or the mounds of unsorted clothing that were sprawled out on wet grass in front of a church. Someone at that site suggested that coat racks and hangers would be useful for sorting and keeping the donated clothing clean. That’s a good idea, no doubt, but I can’t help wonder why residents of the six-story brick buildings and high rises, whose belongings were not ruined by flooding, are being deluged with used clothes. Their most pressing needs are for electricity, heat, flushable toilets, and access to transportation. The landscape has definitely changed since the last time I was here: a number of New York City Housing Authority buildings now have humming generators with electrical chords snaking through windows. We were told that some places were getting electricity, thanks to the generators, but still had no heat. Many more floodlights are now positioned at intersections along Beach Channel Drive, and there is a much bigger official presence on the ground: more police, more National Guard troops, and, most notably, a parking lot filled with ambulances ready to be deployed to residents of this slender peninsula who are in need of medical treatment. A friend of mine who often drives through the neighborhood to avoid traffic on the nearby highway said there was more activity on the streets than he’d ever seen. He also mused that it is probably the first time in decades that white people aren't locking their car doors as they drive into and through this poor, largely African-American violence-plagued neighborhood that tends to make it into the mainstream media only for the bad stuff that goes on there. I'm sure the increased police presence makes those who live here feel safer, particularly in the absence of electricity. But this is also a community where the New York Police Department's stop-and-frisk policy has angered many young people. The Rockaway Youth Task Force has worked hard on the issue, organizing meetings among the community's youth and its cops, so each could learn about the other's experience. They say these efforts have helped to create understanding and develop a better working relationship with the police. At the Ocean Village high rises, a complex of privately owned buildings along the Atlantic that were seriously deteriorating from neglect before the hurricane and are now in the process of being sold, residents still lack power, heat ,and the ability to flush their toilets. One woman standing on the periphery of the complex's charmless plaza admitted to me that residents were defecating into garbage bags and throwing them down the trash compactor chute. When I asked her if anyone had contacted the building management about the possibility of getting some generators onto the property, the woman rolled her eyes and told me it was useless. There was a small generator powering a kind of canteen on the building's ground floor, but it was unclear who had procured it. The only service that the management was providing, this woman told me, was its security staff. They have been tight-lipped with information about when the power might come back, she said, but had helped some of the residents carry food and water up the building's darkened stairs, alongside the multitude of volunteers who came into the area to help. About those volunteers: It struck me that many of them probably think that the neighborhood looks this way because of Hurricane Sandy. But the truth is that the condition of the built environment in this area, and the situation of its residents, is only marginally worse now than it usually is. It just took a hurricane for most people to even notice or care. I wondered what the locals were making of the new attention. Many of the Ocean Village residents I spoke with are taking their situation in resigned stride. Already, they are too accustomed to waiting and not making demands, though it is clear many are angry and suffering, particularly the elderly and the sick. Then there are the children who should be at their relocated schools, but instead are outside in the sun. One boy told me sheepishly that his school isn’t starting until the following week, but I am pretty sure this isn't true. More likely his parents either don’t know where the school is now located or are too overwhelmed to figure out how to get him there. Some schools have been moved to neighborhoods well over an hour away. Another kid told me he had spent most of the daylight hours in his apartment reading. But my guess is he was absorbed in watching what might look to him like a freak show outside: the streams of mostly white volunteers parading through his darkened lobby with boxes of stuff to the chaotic Occupy Sandy “distribution center” in the complex's community center, where his neighbors are being herded into yet one more line, and where nobody seems to know what is going on. In fact, most of the people I spoke with in Ocean Village said what they need most now is information. There is no centralized location where they can learn when their power might come back, what transportation is running, how they can get food stamps, or fill a prescription, or charge their phones. Many people want to know if they have to pay their rent for the time when they haven’t had electricity or heat. Or if there will be some kind of financial assistance for people who haven’t been able to go to work. One elderly man told me his neighbor drove a livery cab for a living but his car had been destroyed in the storm, depriving him of his source of income. He had mounting bills to pay. Would there be any help for him? I wish I knew. One enterprising soul had attempted to address this information blackout with a makeshift sign taped to the front door of a building. On it is listed a few locations where food and services can be found, as well as a reminder that the Boys + Girls Club on 36th Street & Beachtown Dr. and the Senior Center on Beach 19th would be open for voting. In spite of their dire circumstances, Rockaway residents did get out to vote. Yet I haven’t heard much talk about politics out here—except from young members of the Rockaway Youth Task Force. Their mission is about youth empowerment through civic and political engagement to bring about long-term change. By nature, their work is political, and these are things that require organization and planning, commitment and struggle, things that can’t be put in garbage bags and trucked in by volunteers. UPDATE: I made several calls to RY Management, the company that manages the Ocean Village complex. I finally got someone on the phone and asked her what the building owner was doing to help residents, and whether there were plans to bring in generators. I was told that someone “from the office” would call me back. I am still waiting for that call. The Rockaway Youth Task Force is a youth empowerment group started in 2011. It is now overseeing a meticulously organized canvassing and distribution effort in Hurricane Sandy-ravaged Far Rockaway, a Queens community in New York City. Pictured far left, Vice President, Silaka Cox. Fourth from right, President / Founder, Milan Taylor. With government officials and NGOs largely absent, young residents step in to provide food, water and medicines in the wake of Hurricane Sandy. The elderly woman came, bundled up, in search of batteries for her portable radio. "We don't know what's going on. We've been cut off from the world. We are very fortunate, my husband prepared for this and even though it's cold, we have food and water. But I don't know where his head was at with the batteries." It was Sunday and Milan Taylor, the 23 year-old founder and president of the 45 member Rockaway Youth Task Force, a youth empowerment group started in 2011, was overseeing a meticulously organized canvassing and distribution effort the group had set up three days prior in a building on Beach 57th Street in their storm-ravaged community, when the government, power company and big relief agencies were nowhere to be found. He added this woman's request, and her name and address, to his delivery list, which included many others who weren't in such good shape, without food or medications, or the means to get them. "We're keeping the door closed," explained Taylor. "It's heartbreaking to do it, but if we let people in to just take stuff, it will disrupt the system." After the hurricane, Taylor, who had evacuated, put out a Facebook call to the Task Force's members and soon he and others were headed back, cars loaded up with food and supplies purchased with the group's now-depleted funds. The plea for help made its way to other web sites, including one put together by Occupy Sandy. By Sunday, Taylor said, close to 200 volunteers had already climbed up and down hundreds of stairs with flashlights. They were assessing the needs of home-bound elderly and disabled residents—many reliant on food stamps and other government aid—at two high rise complexes known as Nordeck and Ocean Village, and documenting them on oak tag charts hung on the walls of the group's headquarters. It was a system devised by the Task Force's 17-year-old Vice President, Silaka Cox, a student at Rockaway Park's Scholars' Academy, whose experience raising money for disaster relief in Japan taught her about how to organize such an effort. The group had already delivered food and supplies to 700 families. Urgently needed prescriptions were being filled with the help of a contact at Doctors Without Borders. Taylor and his volunteers were encountering "a lot of... shell-shocked [people], just walking around in a daze," and others who were "just really grateful" for the help. Some, however, had greeted the volunteers "with an attitude, because they don't really know who we are, so they think that we're in government and we're getting yelled at, 'why is there no electricity, what are you doing for us?' They don't realize we are volunteers from the community, [that] I live here, [that] I'm only 23." Taylor and the others in his group had no idea another storm was expected for later in the week. They, too, had been cut off from information, lacking power, cell phone service or enough gas to get off the peninsula. But they planned to continue doing whatever they could—with one modification. Having heard reports of looting, robberies and other possible violent crime, Taylor said that his group "decided that we're not going back at night anymore. As soon as sundown hits, [we will stop], and with daylight savings, we lost the hour." It was a conclusion the government had apparently come to as well. At a FEMA distribution center staffed by the National Guard about 10 blocks east of the Task Force's headquarters, a man who said he was with State Senator Malcolm Smith's office said it was just too dangerous to drive out in the dark without traffic lights, or to stick around at night.